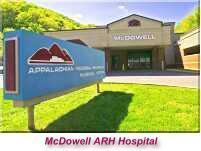 McDowell ARH Hospital is a 25 bed, acute-care facility located in Floyd County, Kentucky. The hospital provides a comprehensive array of specialty medical services and community-based care such as, but not limited to, HomeCare Store, Home Health Agency, Imaging, Rehabilitation Therapy, Senior Care Program and Surgery. McDowell ARH Hospital was recognized with the Excellence Through Insight Award for overall satisfaction in their Outpatient Lab Unit by HealthStream. McDowell is located in Floyd County, nestled in the Central Appalachian Mountains, two-and-a-half hours from Lexington. McDowell is a typical rural town. The people are friendly, everybody knows everyone, and the pace is a bit slower than what you’d find in the hustle-bustle of city living. McDowell and Floyd County offer numerous options for the outdoor enthusiast. Within minutes of McDowell, Minnie Park offers basketball, Little League and Pee-Wee League baseball, tennis courts, a walking track, and playground equipment. Stumbo Park, 20 minutes north of McDowell, offers many of the same features as Minnie Park with the addition of high school and Babe Ruth League baseball, a swimming pool, and a nine-hole golf course. Prestonsburg, the county seat of Floyd County, is home to Jenny Wiley State Resort Park and Dewey Lake, offering camping, swimming, golfing, boating, summer outdoor theatre in an amphitheater setting, the Mountain Arts Center, and lodging. A wide variety of entertainment is located in nearby Prestonsburg and Pikeville. Shopping centers, bowling, and restaurants are available in both towns. Stonecrest Golf Course is an eighteen-hole golf course, located approximately 25 miles from McDowell. To learn more about the community of McDowell, Kentucky, please visit the Floyd County Chamber of Commerce.